Educaspontes Servizo Psicopedagóxico Municipal is dedicated to social and educational care for children and teenagers. There are two education experts and the service is completely free of charge. English lessons for up to 75 children in the Municipality of As Pontes. Children registered in As Pontes are eligible for these courses, while they are doing 3rd-6th year of Primary School and 1st year in ESO (Compulsory Secondary School). Training programme designed to prepare students for the so called key competences: mathematics, Spanish language communication, English language communication and Galician language communication. The target collective for this training course is the unemployed people in As Pontes; especially those who have not completed their studies and therefore have a more difficult time accessing the labour market. Lessons taught to students having permanent special education needs with the goal to ensure that they develop a positive approach to schooling and studying by focusing on basic reasoning skills, reading comprehension, vocabulary improvement and writing skills. Infant School and Nursery, 91 places. Children attend during different shifts from 8 am to 8 pm. 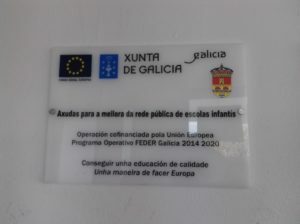 The City Council received a subsidy for the investment in the improvement of infrastructures and equipment of the nursery 0-3 EIM Barosa Co-financed by the European fund for regional development within the framework of the FEDER Galicia 2014-2020 operational program. Secondary, Baccalaureate and Vocational Training School. Secondary, Baccalaureate and Vocational Training School for adults.